CPABC's CareerConnect Employer Showcase is an opportunity to promote your organization to CPABC's designated CPAs and future CPAs (including current and prospective CPA students) who are exploring their career options. The goal of the event is to showcase all the different industries and sectors in which CPAs and future CPAs can take their careers. *Additional booths and representatives can be added to your event order below. Showcase your organization values and opportunities by hosting a 20-minute information session to participants in a separate room during the day. Spaces are limited, sign up for a spot below. Registered recruitment firms will be invited to provide participants with complimentary résumé reviews and feedback on their résumé, alongside CPABC’s Career Councillor. 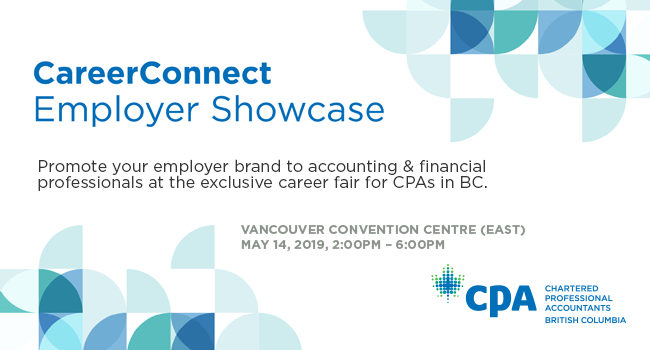 Employers and CPA members are encouraged to attend the post-showcase reception from 6:00pm to 7:30pm exclusive to employers & CPA members only. Exhibitor Manual. Please refer to this manual online. It will be updated regularly as new information becomes available. CareerConnect Employment Program Partners receive $50.00 off the price of the booth package. For more information on the program and how to join, fill in the form here and email us ([email protected]) for the discount code. Optional: Would you like to register to host a 20 minute employer information session to interested participants at the showcase in a separate room? Please send us your power point presentation ([email protected]) by April 23, 2019 if you would like to include one. A member of our Careers Services team with be in touch with more information. Yes I will provide a power point presentation. Are you accepting resumes at your booth? Would you like to register additional representatives to what is included with the purchase of your booth? All registrations must be accompanied by payment. Changes or cancellations to your registration must be made in writing (email is acceptable) to the Careers Team at CPABC, and will be subject to the cancellation policy as indicated below. More than 30 days prior to the event – a refund less an administrative fee of $100 will be granted upon receipt of written notification. Less than 30 days prior to the event – no refund and/or credit will be granted. Full program fees will apply. I acknowledge that I have read and understood the Cancellation Policy. By participating in the Employer Showcase, your organization agrees to follow the guidelines set out in the CPABC Post-Secondary Recruitment Framework when campus hiring for Pre-Approved Program Route (PPR) positions. Read the CPABC Post-Secondary Recruitment Framework here. Yes, my organization agrees to follow the guidelines set out in the CPABC Post-Secondary Recruitment Framework when campus hiring for Pre-Approved Program Route (PPR) positions, if applicable. If you have any questions, please contact CPABC Careers at 604-629-8373 or [email protected].